Previously the current owners of Pyrotect were in the fuel cell business. They served many of us for a number of years, with good products and fair treatment. Many of us were not happy, for a long time. Their "non-compete" agreement is now over and they have re-joined the fuel cell business in hopes of better serving us who have complained loudly about the poor quality and mistreatment from their previously business. Although we are normally associated with custom, single-seater car type cells, the following information is for those with standard steel or aluminum container type cells. We still offer custom bladder cells as used on single-seater vehicles and as the information increases we will publish it here. Let us help you with a return to a fair priced, quality constructed fuel cell for your application. 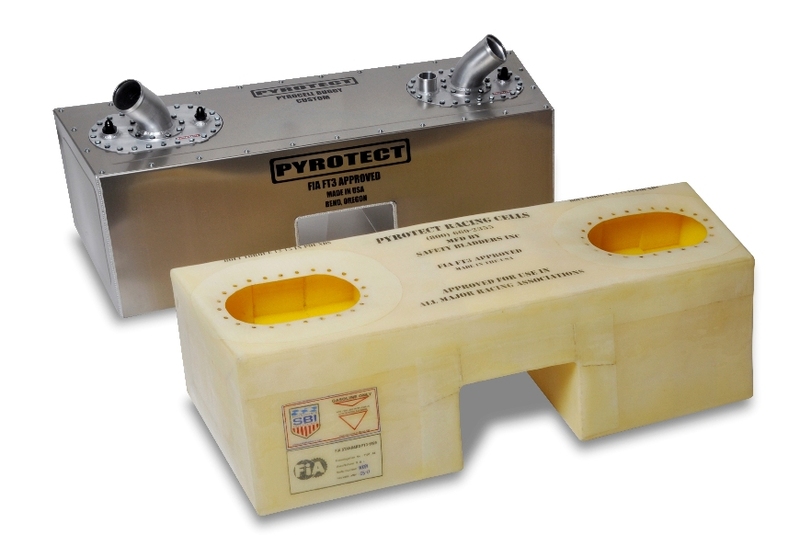 Pyrotect FIA-FT3 approved fuel bladders in standard and custom sizes. All the safety by design of the other Pyrotect fuel cell series for those with Single seater of Sport racers where the cell is positioned in the chassis behind fire walls which are part of the structure. 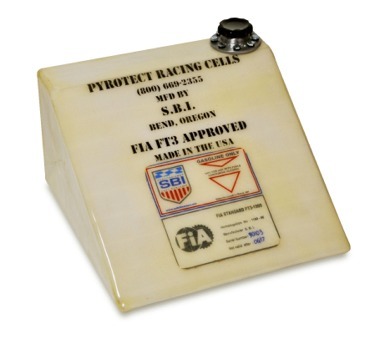 Pyrotect's top of the line racing FIA-FT3 approved Elite Series cells are designed for all types of racing applications. The Elite series comes complete with a standard billet 3-1/2" threaded neck and cap with Pyrotect's exclusive billet aluminum flapper valve standard, -8AN fuel pick-up and a -8 vent check valve. PE 105 5 gallon 13.62" 13.62" 8.37"
PE 108 8 gallon 20.12" 12.12" 8.62"
PE 110 10 gallon 25.62" 10.12" 10.12"
PE 112 12 gallon 20.12" 17.12" 9.12"
PE 115 15 gallon 24.62" 17.12" 9.12"
PE 117 17 gallon 20.12" 17.12" 12.12"
PE 118 18 gallon 28.12" 17.12" 10.12"
PE 122A 22 gallon 34" 17.5" 9.5"
PE 122B 22 gallon 25" 16.75" 13.62"
PE 122C 22 gallon 32.62" 18" 10"
PE 112D 22 gallon 33" 17" 9.25"
Cell sizes up to 60 gallon available. 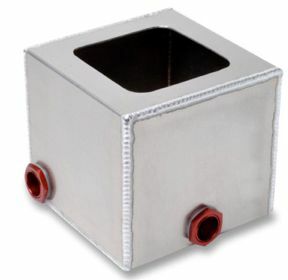 Add -A suffix (PE 105-A) to part number for aluminum container. 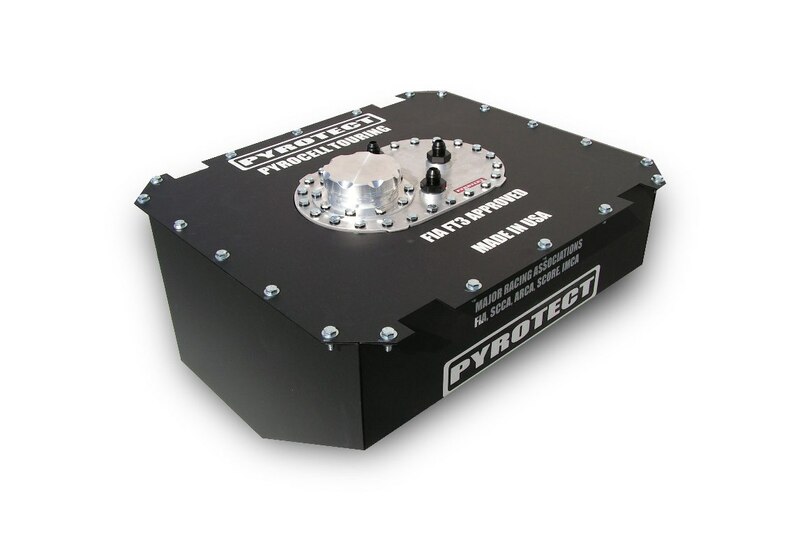 Shown here in a steel container, Pyrotect's top of the line racing FIA-FT3 approved Touring series cells are designed for sedan style road racing applications. Custom cells with a steel or aluminum outer housing like this example from the Pyrocell Buggy Cell series.